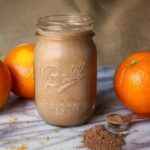 Slightly sweet and zealously zesty, this Orange Mocha Latte smoothie is just what you need to get energized to take on the day. Cocoa powder makes this Café Latte Shakeology recipe taste like a frozen mocha drink from a coffee shop, and the fresh citrus flavor will make it the highlight of your morning. This Orange Mocha Latte combines chocolate and orange! Place almond milk, ice, Shakeology, cocoa powder, and orange peel ice in blender; cover. Blend until smooth.